This may seem obvious in cooking, but every slight adjustment in the amount of ingredients and how they were prepared changes the profile of the meal. Just like cooking, events are all about the “ingredients.” Every detail choice and inclusion changes the profile of events. For dinner event experiences, every piece of décor and lighting changes how attendees consciously and subconsciously react to their experience at the event. Every talking point adjusts the mood and takeaway from the event. Every brand ambassador’s enthusiasm level shifts how attendees perceive the event. Every small detail in both cooking and events changes the profile of the experience. Yes, there is a level of “feel” in cooking, but anyone can follow a recipe. It just isn’t quite the same though as making an existing recipe “your own” through ingredient alterations or whipping up your own unique concoction. The same goes for events. You can rent existing photo experiences or activation elements; but creating something from scratch (physical or digital) that truly embodies a brand and its messaging creates a deeper connection with attendees. Off the shelf has its time and place, but creating unique memorable experiences (and meals) are just a bit better when done right. In cooking, you can cut corners and buy pre-cut vegetables or a store-bought marinade. However, if you do it right, preparation and cooking can take a lot of time. And even if you do cut a few corners, rushing the actual cooking (or baking) compromises the outcome. The same goes for events. 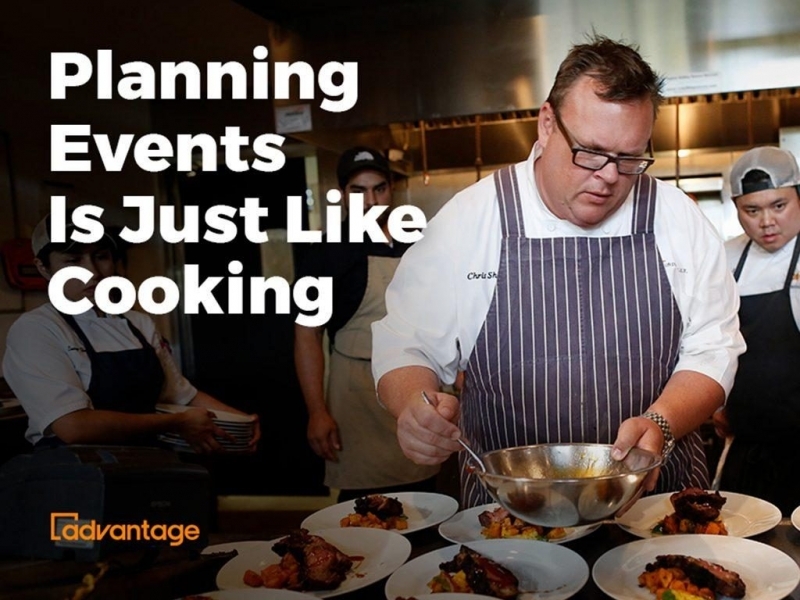 Often we hear “it’s just an event, it can’t take too much time to plan.” But the reality is planning an event is a lot of work….especially to do it right. From concepting, to design, to production and fabrication; events are a delicate balance of getting things done as quickly as possible, while managing timelines, budgets and maximizing the attendee experience. To cook the perfect meal or produce the perfect event, time is simply needed to do it right. Your dish tastes incredible. You cooked it perfectly. Seasoned it perfectly. But not going to lie, it looked a little like mush. Presentation is important to creating that perfect meal. From wiping off that drip of sauce to adding a topping of fresh parsley, the contrast and simplicity of plating can take a dish from good to great. The same goes for events. Attendees can see the difference in cheap materials versus premium substrates, or even skimping on a one-color process logo versus four-color. For both events and cooking, you can have the perfect idea, but if they aren’t packaged and executed perfectly in the end, it can hinder the final outcome. Cooking and event planning require a whole lot of time and effort invested. But it’s all worth it when the final product is experienced. The mincing was justified for the cooking. The long nights of working on the production of the event validated. All of the time and effort into perfecting the experience was worth it because of the smile at the end. While cooking and planning events are (of course) very different, being close to both I’ve come to see the many similarities. While I might not be a master chef yet, after planning a few more events it might just teach me how to become a better cook!